“The solar component is real but not of sufficient magnitude to have driven most of the warming of the late 20th century,” Pat Michaels, the former president of the American Association of State Climatologists, and current director of the Center for the Study of Science at the Cato Institute, told FoxNews.com. But Michaels said that if the U.N. increases its estimates about how much the sun affects Earth’s temperatures, it might help the U.N. get its prediction models back on track. While the Earth warmed over the last two decades, it did so more slowly than the U.N. had predicted. “Climate science has the problem of trying to explain why we are now in our 17th year without a significant warming trend. As a result, you are seeing many forecasts of warming for this century being ratcheted down,” he said. Others say that the focus on solar activity distracts from the big picture -- the fact that the Earth is warming. “I see climate contrarians try this trick almost every time a big new solar study comes out. They somehow tend to neglect mentioning that solar variation is smaller than the heat-trapping power of carbon dioxide,” Aaron Huertas of the Union of Concerned Scientists told FoxNews.com. To back that up, Huertas points to data that show that solar activity and temperature rose together from 1880 until 1960, but that then, solar activity stopped increasing -- even as temperatures continued going up. “The basic evidence is that solar activity has varied a bit while global temperature keeps going up,” Huertas said. But Rawls said that while solar activity has indeed stopped increasing, the important thing is that it remains at a historically high level. Rawls worries that if solar activity falls, the effects could be dire. NASA has said that there is evidence that the most recent “Little Ice Age” was caused by a dip in solar activity. “Almost no sunspots were observed on the sun's surface during the period from 1650 to 1715. This extended absence of solar activity may have been partly responsible for the Little Ice Age in Europe,” during which temperatures were colder by about 1.8 degrees F than they are today, he said. But Huertas said that’s not what we should worry about at a time when the effects of warming are already being felt. “Climate change is affecting weather all across the planet and when it comes to extreme weather, the strongest links are to coastal flooding [and] heat waves,” Huertas said. “While climate skeptics are arguing on the Internet about drafts of the report, states like New York and New Jersey are working to help people rebuild their homes in ways that have a better chance of surviving more destructive storms and flooding in the future,” he said. An "intensitygram" from the Helioseismic and Magnetic Imager on NASA's Solar Dynamics Observatory shows the double-barreled sunspot active region 1416 pointing toward Earth. As solar activity builds toward an expected peak in 2013, a double-barreled sunspot has been doubling in size over the past couple of days and now has the potential to shoot significant eruptions in our direction. It's not certain that active region 1416 will erupt with coronal mass ejections as violent as the blasts that were thrown off by the sun late last month. 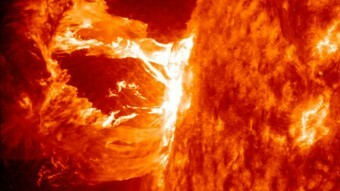 But it has developed a mixed "beta-gamma" magnetic field that packs enough energy to throw off medium-scale solar flares, SpaceWeather.com reports. "Any such eruptions this weekend would be Earth-directed as the sunspot turns to face our planet," SpaceWeather's Tony Phillips wrote. Medium-size M-class flares are generally associated with the kinds of solar storms that produce enhanced auroral lights, but not huge inconveniences on Earth. It's the X-class flares you really have to watch out for: That level of solar storming could affect radio communications as well as satellites and electrical grids if the operators of those systems aren't careful. The sun has unleashed a blast in Earth's direction, and that should cause brighter-than-normal auroral displays this weekend. Skywatchers won't be the only ones monitoring the storm: The folks in charge of power grids and orbiting satellites will also be on guard to make sure the disturbance in the (geomagnetic) force won't be disruptive. 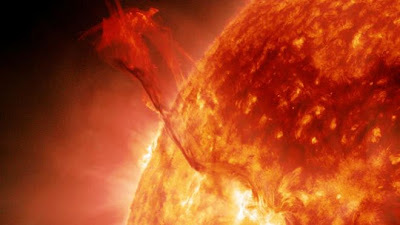 Word of today's blast, technically known as a coronal mass ejection or CME, comes via SpaceWeather.com's Tony Phillips. NASA says the outburst sparked an M3.2-class solar flare, as well as a stream of electrically charged particles that is due to interact with Earth's magnetic field on Saturday. "Viewers can be on the lookout for increased aurora," NASA says. Epic Light Show Flashes Above U.S. Right this moment, there's an epic magnetic battle raging above our heads. On Monday, at around 2 p.m. ET, a coronal mass ejection (CME) slammed into the Earth's magnetosphere. According to NASA's Space Weather Laboratory, the conditions were just right for the CME's magnetic field to compress the Earth's magnetosphere so much that, for a short time (between 3:06 p.m and 3:11 p.m. ET), energetic solar wind particles penetrated as deep as geosynchronous orbit -- home to hundreds of communication satellites. ANALYSIS: Epic Aurora Caught Cross Country -- Share YOUR photos of the aurora! Although the interactions between solar plasma and Earth's magnetic field are often invisible, tonight is an exception. Vast aurorae are rippling through the atmosphere at very low latitudes. Northern Lights have spilled across the Canadian border into the contiguous USA. Sighting reports have come from as far south as Arkansas, Wisconsin, Michigan, Tennessee, Missouri, Illinois, Nebraska, Kentucky, Indiana, Oklahoma, Kansas, Maryland, New York, Ohio and central California. Yes, central California! To see some of the auroral displays, the Universe Today has a few reader's photos featured. My personal favorite is an earlier photograph taken in Norway. An international panel of experts, led by the National Oceanic and Atmospheric Administration (National Oceanic and Atmospheric Administration or NOAA, in English) and sponsored by NASA, has issued a new forecast for the next solar cycle. 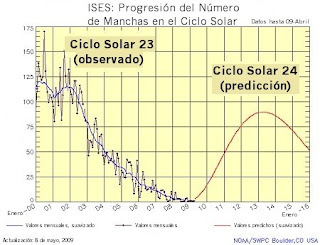 Solar Cycle 24 will its maximum, say, in May 2013 with a sunspot number below average. "If our prediction is correct, Solar Cycle 24 will have a maximum of 90 spots, the lowest number of all cycles counted since 1928, when Solar Cycle 16 peaked at 70 spots," says the head of the panel, Doug Biesecker of the Center for Space Weather Forecasts (Space Weather Prediction Center, in English) from NOAA. It is tempting to describe a cycle of these characteristics as "weak" or "soft", but that might give the wrong impression. "We still remain below average, any solar cycle is capable of producing severe space weather," notes Biesecker. "The great geomagnetic storm of 1859, for instance, took place during a solar cycle of the same size as we're predicting for 2013." 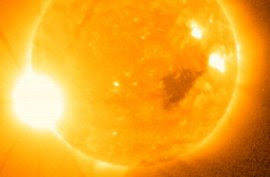 The storm that occurred in 1859, known as the "Carrington Event" in honor of the astronomer Richard Carrington, who witnessed this tremendous solar flare electrified transmission lines, caused fires in telegraph offices and produced Northern Lights so bright you could read the newspaper in its light reddish-green. A recent report provided by the National Academy of Sciences, concluded that if a similar storm occurred today could cause between 1 and 2 billion dollars in damage to the infrastructure of our highly technological society, and lead to four to ten years to achieve full recovery. By comparison, Hurricane Katrina caused damage "only" 80 to 125 billion dollars. "It happened that neither of the two models was quite correct," says Dean Pesnell of Goddard Space Flight Center, who was the NASA representative in that panel. "The sun is behaving in an unexpected and very interesting." Researchers have known of the solar cycle from mid-1800. The graphs represent the number of sunspots counted since those days are like a roller coaster, up and down with a period of approximately 11 years. At first glance, seems to be a regular pattern, but predicting the peaks and valleys has proved problematic. Cycles vary in length between approximately 9 and 14. Some peaks are high, others low. The valleys are usually short, lasting only a couple of years, but sometimes spread and become much longer. In the 17th century, the sun sank into a period of 70 years with no stains, which is known today as the Maunder Minimum, and still baffles scientists. Right now, the solar cycle is in a valley - the deepest in the last century. In 2008 and 2009, the sun has broken records of the Space Age for the lowest amount of spots, weak solar wind and the low solar irradiance. It has been more than two years that the Sun emits a solar flare of significant size. "In our careers, we had never seen anything like it," says Pesnell. "Solar minimum has lasted much longer than the date predicted in 2007." In recent months, however, the sun has begun to show signs of life, but very timid. Small spots and "proto-spots" sun begin to appear more frequently. Huge plasma flows on the solar surface (known as " flow zone ") begin to increase in intensity and move slowly toward the solar Ecuador. Radio astronomers have detected a small but significant increase in solar emissions in radio waves. All these things are the precursors of an awakening of Solar Cycle 24 and form the basis of new and nearly unanimous forecast provided by the panel of scientists. According to the forecast, the sun should remain calm for at least another year. From the standpoint of research, that's good news because solar minimum has proved more interesting than anyone had imagined. 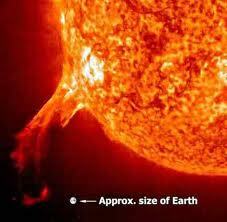 The low solar activity has a profound effect on the Earth's atmosphere, allowing it to cool and contract. The debris accumulates in orbit around the Earth because there is less aerodynamic drag. The quiet storm produces less solar wind around the magnetic poles of Earth. Cosmic rays are usually bounced by the solar wind, slip instead into the near-Earth environment. There are other side effects, too, that can only be studied under the sun remains quiet. Meanwhile, the Sun cares little human committees. There could be more surprises, the panelists agree, and thus more forecast revisions. "Go ahead and mark your calendar for May 2013," says Pesnell. "But mark it in pencil." Our planet is gearing up for its largest magnetic storm in years - which is due to arrive later on Friday. A number of scientists have warned of a possible technological disaster, while some people are taking the precaution of staying away from electrical appliances like TVs, kettles and toasters.